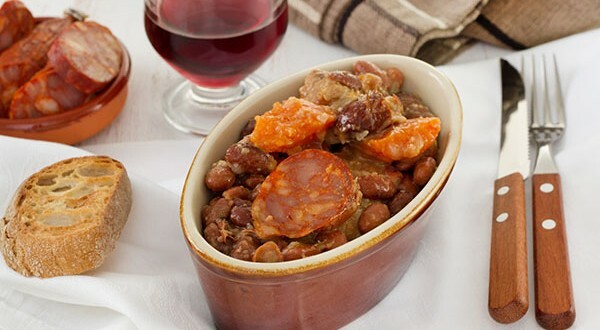 An adaptation of the Andalusian dish Fabada, this pinto bean stew is seasoned with andouille sausage, bacon, tomatoes, onions, peppers, and smoked paprika. Fans of spicy beans should use the full amount of minced chile pepper (or more). Serve with brown rice and sour cream. Heat oil in a large heavy casserole or Dutch oven over medium heat. Add sausage and bacon and cook, stirring occasionally, until the bacon is almost crisp, 7 to 10 minutes. Remove with a slotted spoon to a small bowl and set aside in the refrigerator. Add onions and garlic and cook, stirring, over medium heat, until soft and lightly brown, 3 to 5 minutes. Add bell peppers and chile pepper to taste; continue to cook, stirring, until the mixture is soft, about 3 minutes. Stir in paprika. Add tomatoes and cook until they release their juice, about 2 minutes. Drain the beans. Stir the beans and 8 cups water into the pot; bring to a boil. Reduce heat and simmer, uncovered, for 1 hour. Stir in the reserved sausage and bacon along with salt and pepper. Continue simmering, adding a little water if the beans are dry, until the beans are very soft and beginning to break down, about 30 minutes more. Stir in lime zest and juice. Andouille sausage is a smoky, mildly spicy pork sausage commonly used in Cajun cooking. Look for it near other smoked sausages in large supermarkets or specialty food stores. Ingredient Note: Smoked paprika is a spice made from grinding smoke-dried red peppers. It can be used in many types of savory dishes and is available in some large supermarkets with other spices and at tienda.com. Tip: To soak beans using a “quick-soak” method: Place beans in a large saucepan with enough cold water to cover them by 2 inches. Bring to a boil. Boil for 2 minutes. Remove from the heat, cover and let stand for 1 hour. Carb Servings: 2 1/2 starch, 1 vegetable, 2 lean meat, 1 fat Carbohydrate Servings: 2 Nutrition Bonus: Vitamin C (80% daily value), Folate (63% dv), Potassium (23% dv), Iron & Vitamin A (20% dv).